This city’s always had a serious shortage of proper, American-style pies. Fortunately, RJ Asher is ready to rectify this situation. The New York native who moved to Hong Kong three years ago proudly calls himself “the ultimate pie guy” and it’s no lofty claim. 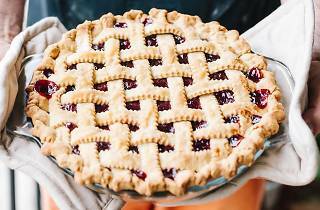 His online shop Tai Tai Pie Pies peddles hefty handcrafted pastries the way mama (his, probably not yours) used to make, with deliciously buttery crusts, generously heaped ingredients and – cheesy as it sounds – plenty of love. 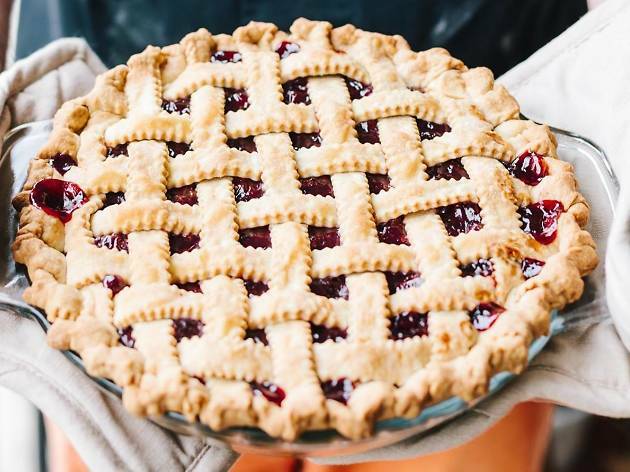 While Tai Tai Pie Pie's online shop offers well over a dozen sweet and savoury pies, quiches, cakes and cookies, it’s his All-American Apple Pie that deserves extra special mention. Plumped with a whopping ten cups of apples and a delicious five-spice mix, this monster packs enough goodness to fill an entire room with that delectable freshly baked fragrance. Granny Smith is the mainstay in the pie (for that special crunch and tart flavour, Asher explains), but he also blends in four other fruits, including sweet Fuji apples. The nine-inch pie comes in a glass dish, baked fresh on the delivery day with a perfectly crumbly, sweet butter crust. No preservatives, additives or pre-mixes are used anywhere during the entire baking process. Beyond the apple, Tai Tai Pie Pies also do a mean chocolate pecan pie filled and topped with a healthy dose of chopped and whole nuts. The Tai Tai Lime Pie is another popular choice made with sweet graham crust and a tart, citrus-tinged custard filling. On the cake front, Asher does a super decadent German chocolate cake, as well as the moist Not for Rabbits Carrot Cake that’s slathered in cream cheese frosting. Asher offers catering services for larger parties, as well as baking classes for those who want to replicate his fabulous pies. Place an orders through the website (two days advanced ordering recommended) and the pies will be personally delivered from the oven to your door. Alternatively, choose the pickup option and collect your order at one of their two locations, GREAT Food Hall in Admiralty or the Pie Factory in Fo Tan.